In this article, I will show you how to grow an abundance of food regardless of how much indoor or outdoor space you have. With options ranging from vertical gardens to windowsill starters and herbs, there are plenty of options to fit anyone’s tight space and budget. One of the most obvious reasons to start a food garden is so you can produce lots of food for the price of the original seed. Not only will your food be more affordable, but healthier too. When you garden, you have control over how your food is cultivated. You can choose to leave out harmful pesticides, use only non-genetically modified seeds, and use organic fertilizers. Not only is home-grown food healthy, but the act of gardening is healthy in and of itself. Did you know that a 150-pound person can burn roughly 350 calories per hour of gardening? It’s a good workout and a great way to feel connected to your food and nature. In today’s rushed society, we can sometimes become detached from our roots. Gardening, like many hobbies, can be a form of meditation to ground us when life gets chaotic. If you garden outside, you also have the benefit of getting more vitamin D without the use of tablets. Believe it or not, there are many creative options to help you set up a food garden in any room or space. You can grow a lot of food in one area, or you can have your food dispersed throughout your home. If you are afraid that your food garden will clash with your indoor or outdoor decor, allow it to accent your space. You can plant in the ground, on the floor, on the walls or in the air! The options are as limitless as your imagination. You can live in any climate and still have fresh greens for your family! Some of the easiest things to grow are microgreens. In small, shallow dishes, press in some potting mix and plant your seeds. Water them and place the container on a windowsill or outside in direct sunlight. In one or two weeks after germination they will be ready to harvest. That’s it! Another way to enjoy growing microgreens is to sprout. You can sprout anything from vegetables to legumes and grains. It’s so versatile, you can even eat them raw! All you have to do is rinse the seeds and transfer them to a jar or pot with some water. Drain the water, rinse them, and refill the water to cover the seeds each day until they begin to sprout. It’s that simple! These are great options if you are in a dorm room or small apartment. In their very nature, seed starters don’t take up a lot of space. This is because they are meant only to house seeds until they begin to sprout. You can use almost any small container to house tiny plants and seeds. Some people use small pots while others use small Mason jars, egg cartons, and even egg shells. You can have them dispersed throughout the house or keep them in one location. To save space, line them against a wall, countertop, or windowsill. If you want to use them as decor that won’t take away from counter space, place them in small, clear containers and hang them from the ceiling at varying heights. You can also hang them on a wall or along a fence. You can use some of the above options for small plants, as well as sprouts and seeds, to save space and beautify your home. For small plants, you have even more options though. If you want your plants to be in the same space, you can hang them vertically in larger planters or in the ground next to each other in raised beds. Vertical gardens and spiral gardens are a popular trend. For vertical gardens, you can grow plants upward or outward in separate containers that are placed in rows and columns and hung on a wall or fence. If you don’t have small containers, you can use beer or soda bottles or jars. You can even hang windowsill containers or wood pallets vertically! Spiral gardens are raised beds that allow you to plant more by placing your crops along a line that spirals to form a cone at the center. A combination method would be to grow towers or pyramids of food. You can also use a large pot to store multiple small plants next to each other. These options are ideal for lettuce, herbs and other smaller crops. At the other end of the spectrum are large crops, such as corn, tomatoes and fruit trees. These are best planted in the ground. Although we often see giant rows of corn in movies and farms, your corn can easily cross-pollinate in a smaller area if you use rows and columns to form a small square in your yard. Tomatoes can be grown in containers and can even be grown upside down from the ceiling. To maximize space when growing fruit trees, prune them to keep them under 12 feet tall so you can grow more of them in less space. You can also find fruit trees that produce a variety of fruits on one single tree. There’s free food in abundance everywhere if you know where to find it. Every type of wild grass is edible. Dandelions and other weeds that are often killed by gardeners are actually edible as well. When you see one or a few pop up around your crops, you can transplant them separately to use them and keep your other crops safe. Some herbs, such as mint or lemongrass, can be considered a weed because they can easily take over your herbal garden. To keep these free spirits from growing wildly, you can grow them separately in a container or in the ground away from your other plants. One surprisingly convenient and efficient way to grow food is with gutters. If you stack them like step ladders on the side of your house, the rain water can more easily reach your plants. Also, by having them against your house, they are out of the way, so you, your kids or your pets can gallop freely through your yard. A creative way to have a small vertical garden is to use an old hanging shoe organizer to store plants. It’s a fool-proof way to grow vertically and not risk soil leakage or roots fighting for resources. Another beautiful way to grow small plants is to plant them in cups that hang upside down. How do you keep the soil from hitting you in the face? Like with many vertical garden designs, you just cut a hole in the cup around the stem of the plant and make sure the soil is tightly compacted. Biointensive agriculture is a phrase used to describe the maximization of your farm or food garden’s yield in a small space. Using a blend of the above-mentioned techniques, you can easily maximize the amount of food you have available to you and your family. With some planning, you can grow all the food your family needs on one acre or less. In fact, biointensive agriculture has advanced to where well-versed farmers have been able to grow their family’s food on just one-tenth of an acre! Growing upward and outward or underneath the ground, the creativity of these farmers demonstrates that food gardening can be just as much of an art form as it is a biological science. If you don’t have an acre or any outdoor space, the above-mentioned space-saving techniques can be used inside your home or apartment to provide safe food at a low cost with little to no fuss. While growing to meet all of your family’s food needs may be out of reach for many, smaller crops that can be grown indoors are especially good if you are just starting out and can be done by anyone. 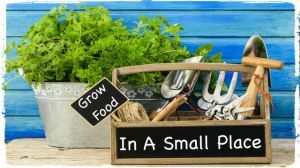 Start small, and as you develop your understanding of how gardening works, you will gain confidence and be better able to expand both your knowledge and your food garden. It will take time, but with some practice and courage you can have your very own micro food garden to produce free food that will continue to replenish itself. Next articleDon’t Buy into the Hype of Bottled Smoothies: 7 Reasons to Make Your Own Instead! Hey Buddy!, I found this information for you: "Start a Food Garden with Little Space". Here is the website link: https://www.thealternativedaily.com/start-a-food-garden-with-little-space/. Thank you.